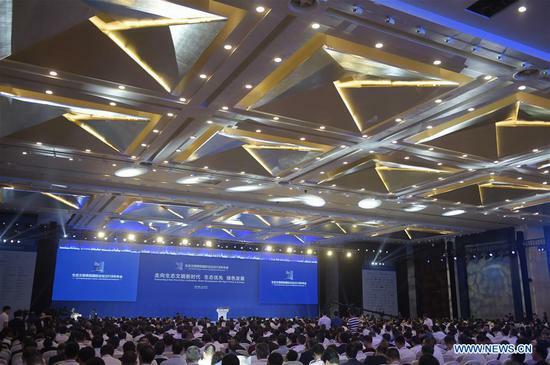 GUIYANG, July 7 (Xinhua) -- The Eco Forum Global Annual Conference Guiyang 2018 opened Saturday in Guiyang, capital of southwest China's Guizhou Province. Chinese Vice Premier Sun Chunlan, also a member of the Political Bureau of the Communist Party of China (CPC) Central Committee, attended the opening ceremony of the three-day conference and read a congratulatory letter sent by Chinese President Xi Jinping. Xi wrote that he believed the annual conference, themed "embracing a new era of eco-civilization: green development with high priority to ecology," would help all parties strengthen consensus and cooperation for the development of global ecological civilization. "China is ready to work with the international community to realize the 2030 Agenda for Sustainable Development and build a clean, beautiful world," he said. Sun emphasized that ecological conservation was a common challenge and responsibility for countries in the world, and China would strengthen international cooperation in ecological conservation, and push forward the implementation of the United Nations 2030 sustainable development agenda and the green development of the Belt and Road, jointly safeguard the Paris agreement on climate change, and provide China's wisdom and solution to global ecological conservation efforts. "Only when we prioritize ecology, can we really push forward green development, and then achieve a win-win situation of development and protection for both human and nature," said Zhang Xinsheng, secretary general of the forum and president of International Union for Conservation of Nature. Executive director of the International Energy Agency Fatih Birol said that he hoped China's clean energy technologies could be applied in good business models and benefit-and-cost ratios throughout the world. The eco forum, established in 2009, is committed to improving the world ecological environment by engaging business, political, academic and other leaders in the shaping of global, regional and industry agendas. This year's conference will center around topics including ecological conservation and poverty relief, green industries and enhancing rural life. Over 2,400 political and business representatives and experts from 35 countries and regions are attending.